This book examines the intricate and unusual relationship between the sacred and secular spheres of English medieval culture, positing that the assimilation of sacred and secular motifs could be in either direction, or even in both directions. That is, medieval English writers could appropriate biblical paradigms to express secular themes, and vice versa. Codicological, psychoanalytic, feminist, and new historicist insights inform readings of Beowulf, Middle English lyric poetry, the Gawain-poet, Chaucer, and Malory, among others. Besserman elucidates the structural and thematic complexity of the integration of biblical and biblically derived sacred diction, imagery, character types, and themes in the works under consideration, identifying within them new biblical sources and analogues and providing fresh insights into the contextual meaning and significance of the biblical paradigms they deploy. 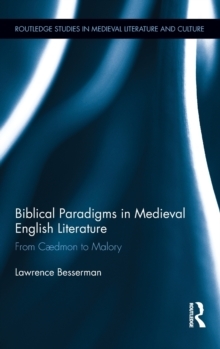 This book highlights the shaping influence of biblical and biblically derived sacred paradigms on exemplary literature produced in the middle Ages.